Tens of thousands of people gathered in Tahrir Square in Cairo last week to call for Egypt’s military rulers to speed changes and crack down on corruption, one week after Hosni Mubarak resigned as president. Egypt overthrew its longtime leader while the world watched. But its economics and demographics suggest that the next leader will not be particularly democratic. 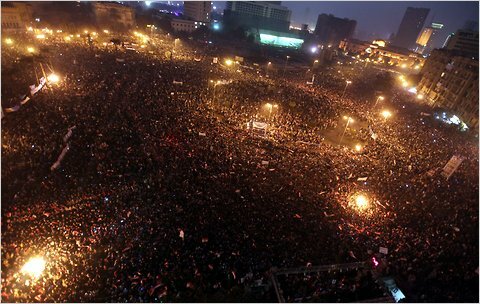 Almost three weeks of pro-democracy demonstrations in Egypt ended Hosni Mubarak’s reign as president. Widely regarded as undemocratic, he enjoyed decades without a serious challenger for his position, and, among other things, did not hesitate to shut off Egypt’s Internet access when he thought it might help keep him in power. Now the Egyptian military is in charge and promises to hold elections in six months. But elections are not the same as democracy unless more than one candidate has a fair opportunity to run. Living in the United States, it is often difficult to imagine anything but a fair election for president and the other major government positions, but our world is full of countries with rigged elections that, for example, require that candidates be approved by the government. Mr. Mubarak himself won sham elections. With the next elections be any more genuine? Will the winner of those elections be willing to keep the process going? I used a recent study in The Economic Journal to help me assess the outlook. Prof. Kevin Tsui of Clemson (my former student at the University of Chicago) studied democratization in 132 countries in the latter part of the 20th century – democratization referring to the process of moving from rigged to fair elections, allowing free speech, free political expression and so on. Based on its past elections, Egypt was considered among the least democratic countries in the world, although a bit more democratic than some of its neighbors, like Saudi Arabia and Libya. Professor Tsui found that oil resources are an important variable – the more valuable a country’s oil resources, the less likely it is to become democratic. Interestingly, Professor Tsui finds that Egypt is about average in terms of oil resources, so that variable by itself does not lead us to expect that Egypt’s future elections will be all that different than they were in the past. Egypt is more Muslim that the average country in the world, and somewhat poorer in terms of per-capita gross domestic product. Professor Tsui found both of these conditions to be associated with less democracy. On the other hand, Egypt is more ethnically homogeneous than the average country in the world and more homogeneous than nearby Iraq and Libya. Homogeneity is a factor associated with more democracy. Over all, Professor Tsui’s study shows that the Egypt of Mr. Mubarak has been about as nondemocratic as countries similar to it in terms of demographics and economic circumstances. Professor Tsui, who wrote his paper before Egypt’s revolution, did not offer a prediction of what would happen there next. But if the same factors continue to be important determinants of democracy, little may change in Egypt. One thing that seems different in Egypt’s revolution is that an executive at Google is credited with helping plan the protests with his Facebook page. Perhaps a dictator’s survival is more difficult these days in a world with Twitter, Facebook and other technologies for coordinating revolutionaries. But nondemocratic leaders will fight back, and I expect the Internet revolution will, in the near term, cause government to monitor, censor and otherwise regulate the communications of its political opponents more, not less. Moreover, new technologies can also help governments control their citizens, using such tools as pilotless spy drones and urban surveillance cameras. So I will be somewhat surprised if the aspirations of Egypt’s democracy proponents are realized in the next decade. Egypt’s next leader or group of leaders will have a different name, but are likely to reign with tight political control. The war on drugs sends middle- and upper-class American problems to the residents of poor areas. Nevertheless, the federal government continues the war in earnest. Almost 20 years ago, an infamous memo by Lawrence H. Summers, at the time the chief economist of the World Bank, stirred a debate as to whether it was appropriate for the United States and other developed countries to pay poor countries to accept dirty industries, toxic waste or other garbage from the developed world. Both sides in the debate seemed to agree that it would be inappropriate to force poor countries to accept our garbage, without compensation. But that’s very much what the war on drugs does. The war is an outright prohibition on the sale and consumption of contraband substances in the United States. That prohibition is enforced domestically by federal and local law enforcement and abroad by the United States military. Some of the most violent battles are fought in Mexico, Guatemala and other countries poorer than the United States (see especially the comments of Gary Becker of the University of Chicago on this topic). The war also foments violence in our poorer inner cities. Yes, the war makes it more costly for Americans to obtain the prohibited substances. Yet plenty of people in the United States are willing to pay the higher prices – prices far in excess of what it costs to grow, harvest and manufacture the drugs. The gap between the prices consumers pay and the production costs creates a profit opportunity for someone willing to break laws, battle law enforcement and deliver drugs to Americans. Some of these contraband entrepreneurs – drug smugglers and dealers – are from poor countries or poor neighborhoods in the United States, so in this way some American consumer dollars make it to poor areas. Of course, most people in poor areas are not in the contraband business and have no part of the drug industry’s revenue. Yet they suffer enormous harm from the violence and the drug activity. The war on drugs thus pushes the “toxic waste” of America’s drug consumption into poor neighborhoods with no compensation. Middle- and upper-class parents are unlikely to witness personally the war’s violence, and they want to discourage their own children from taking drugs. So many of them appreciate that the war makes it more difficult, or at least more expensive, for their children to obtain drugs. And their appreciation is an important reason why our federal government has yet to legalize drugs and strongly discourages states from doing so. Legalizing and taxing the use of what are now illegal substances would remove the profit motive for dealers and smugglers, and the revenue might be used to help the residents of poor neighborhoods, as Professor Becker notes. The great challenge to ending the war on drugs is finding a way to give American parents the protection they want for their children. The Summer Job Surge: Supply or Demand? The summer teen employment surge is largely a consequence of seasonality in supply, not demand. To see this, note that a pure summer demand surge would draw teens into the labor market with low teen summer unemployment, high summer real wages, and low summer unemployment among persons not enrolled in school during the academic year. The hypothetical demand surge would also have to be quite large – about as large as doubling the size of the nation’s military in a mere two months – because the end result is about a million new jobs for teens. In fact, teen unemployment spikes in June as the labor market absorbs more than one million teens. Unemployment of persons aged 25 and older (not shown in the figures) is high throughout the summer, peaking in July at almost 700,000 persons above trend. Median nominal and real weekly wages for teens are often at their lowest of the year in the third quarter (July – September), and presumably hourly wages are even lower due to longer teen summer work weeks. These patterns reverse when the academic year ends. Also consistent with the supply interpretation, Mulligan (2010b) shows how age groups with the largest summer log employment and log unemployment spikes are those with the greatest school enrollment rates during the academic year, and the summer log employment spike may even be negative for groups with near zero school enrollment. Nor do many of the summer jobs for teens appear to be in industries that have a significant spike in labor demand, because 77% of those jobs are in industries that expand their employment of persons aged 25-34 less than two percent, if at all. Based on calculations from the May, July, and September 2005 Current Population survey, the top industry hiring teens in the summer was “arts, entertainment, and recreation” (accounting for 19 percent of the teen summer jobs), which had no change in the number of persons aged 25-34 employed. The second industry (also accounting for 19 percent) is “accommodation and food services,” which actually cut its employment of persons aged 25-34 by 4 percent during the summer. These are all indicators of supply shifts during the summer that are large, and exceed the demand shifts. Although economists haven’t yet discarded their laptop and desktop computers, the mobile-device revolution has changed how they and their students work. At the University of Chicago, I see more mobile devices from Apple — the iPhones, iPods and iPads — around campus than I do BlackBerrys, or, for that matter, pencils. So I’m focusing primarily here on apps for Apple devices. I also like Economy for iPad, which has major national economic data and state-specific data on unemployment, per-capita personal income, housing starts, G.D.P. and health insurance coverage. Some data is also available on Canada and Mexico, including exports to and imports from the United States and currency exchange rates. Beyond these apps I use for reading, I use PocketCAS Pro to automate relatively simple algebraic and calculus formulas. The Economist magazine has an app for mobile devices that parallels its print edition, in terms of both content and subscription options. Users can subscribe to the digital edition, purchase a single issue or view selected “editors’ highlights.” Users can view The Economist’s compilation of economic and financial indicators, and the app will also play an audio version of feature articles. Of course, I regularly read this Economix blog, to see what my fellow bloggers and our readers have to say. (Did you know that Economix has a Twitter feed?). While these various sites and apps offer excellent content, over time I have stopped going to them directly and instead read all that content through RSS (a mode of information distribution on the Web; its initials stand for really simple syndication) and Twitter feeds. I find these more time-effective ways to skim through a range of content. Many magazines and newspapers have an RSS feed, Twitter feed or both, and often have separate feeds for separate sections, so you could review material from, say, the DealBook and Economix areas of The New York Times, the Markets section of The Wall Street Journal and the latest economic indicators and releases from the National Bureau of Economic Research, all in the same place. Most reader apps notify you when new content is available and offer a measure of how much content you have yet to review. The app I use most these days is River of News, for reading blogs and newspapers that are distributed by an RSS feed. The screen is structured like a river bank and river – with a list of blogs followed to the left and the individual articles flowing past on the right. A user controls the river flow with his finger, stopping to read or letting an article flow by to be marked as read. River of News users can cover many potential reads in a short period of time. Flipboard (shown below) is a slightly less efficient, but a more beautiful reader for both blogs and Twitter feeds. Flipboard automatically digs into the posts of the various blogs and Twitters that you follow to find an image (rather than just text) and displays the image on the Flipboard front page with the headline. 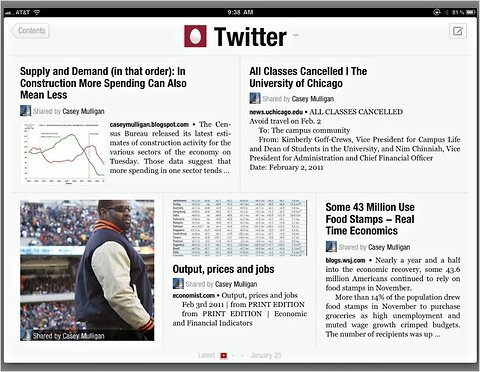 Most reader apps have a function to mark articles for later reading. Instapaper is a nice one that works with several different readers and browsers – creating a button in each for saving articles to your Instapaper account. The app will automatically download articles from your account, and save them on your mobile device so you can read even when not connected to the Internet. Economists read unpublished material, too – including student papers and research papers by colleagues – so we commonly read PDF and PowerPoint files (Adobe’s portable document format and Microsoft’s presentation format, respectively) on our mobile devices. Apple’s iBooks app is an easy and functional PDF reader. ReaddleDocs will display PowerPoint files, too. It helps to take handwritten notes on documents we read – especially those unpublished items that really need changes. I use Note Taker HD (there’s an iPhone version, too) for that purpose. By opening a PDF file with Note Taker HD, a user can use the tip of his finger to write on the PDF much as one would do on paper with a pen or pencil (some people like to use a pencil-shaped stylus to mark a PDF, but it has to conduct electricity so the touchscreen will recognize it; I just use my index finger). Blank pages can be marked too, which makes Note Taker a notepad for (literally) handwriting quick lists, diagrams, equations etc. Once you are creating your own notes and documents, you need an app for sharing the results with friends and perhaps other devices. Note Taker HD lets you convert any of your creations into a PDF file for attaching to an email or transferring to another file manager app. Some file managers, like Files2 HD, manage your files in a folder system on the iPad itself and can allow other computers on your network to view the files. Others apps, like Dropbox, synchronize your mobile-device files with a storage area on the Internet, which you or friends can access from another device. I’m eager to learn of more apps, so readers, let us know what you like. The Census Bureau released its latest estimates of construction activity for the various sectors of the economy on Tuesday. Those data suggest that more spending in one sector tends to reduce spending in other sectors, contrary to the multiplier hypothesis put forward by Keynesian economists. Last week I examined measures of the profitability of capital in the housing and business sectors and noted how, during the housing boom, profitability in the two sectors moved in opposite directions: housing profitability fell while business sector profitability rose. The market appears to have built so many homes during those years because of an expectation that houses would be profitable in the future, and, in part, because home buyers were encouraged by easy credit. As a result, an ever-growing housing inventory was competing for the same demand for shelter, which kept rents low and vacancies high. At the same time, it was more difficult for business to obtain capital, because so much of it was going into housing. The battle for resources between the business and housing can easily be seen in the data for each sector’s structures investment (that is, construction activity), at least before 2009. The chart below shows quarterly data back to the beginning of the year 2000. A value of, say, 90 for either series means that structures investment, adjusted for inflation, was 90 percent of what it was in the first quarter of 2000 (for a related series, see this post). The housing boom and bust are readily visible in the housing sector’s green line, which rose sharply through the end of 2005, and then fell even more sharply through 2009. Nonresidential building normally increases over time with growth in the population and the economy, but it was low during the housing boom (see the red line in the chart), probably because so much capital was going into home building. 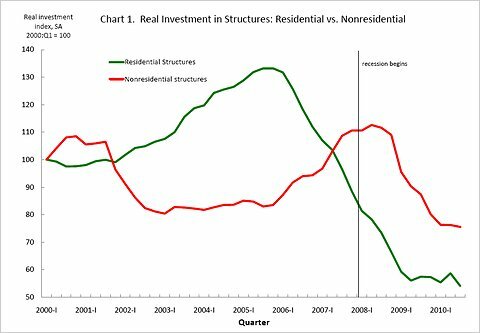 Both residential and nonresidential investment turned at almost exactly the same time, in opposite directions. 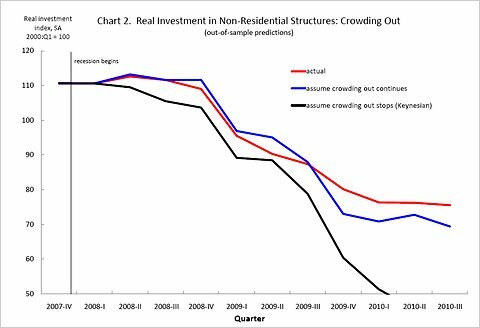 Nonresidential investment increased throughout 2006, 2007 and 2008, while residential investment was collapsing. When President Obama was proposing his stimulus law in early 2009, he and his advisers contended that government spending would stimulate private spending. Yet a number of economists warned that sectors compete with each other for resources, so government spending tends to displace – “crowd out,” in economics jargon – private spending. For example, some people employed by stimulus projects are people who quit their private-sector jobs to accept better positions funded by the new law. Even the Obama administration, in its first Economic Report of the President (click here and scroll to page 124), pointed to the same data and noted how this seemed to be crowding out, at least before the recession. Admittedly, looking at the economy as residential versus nonresidential is not the same as looking at it as public versus private, but the former gives us some information about how economic activity spills from one sector to another. Crowding out comes from scarcity of supply, and Keynesian economists assert that supply is not at all scarce during recessions. Perhaps they would point to the parallel movement of the residential and nonresidential building series after 2008 as evidence that crowding out stopped once the recession worsened. However, even if the availability of former home builders was by itself encouraging nonresidential building, nonresidential building could fall during the recession because of declining demand. The large reduction in the workforce that became apparent by 2009, not to mention tight credit, is likely to have reduced the desired number of nonresidential buildings, and this, by itself, would cut nonresidential investment activity. So determining whether crowding out stopped after 2008 requires separating the effect of increased supply of resources for nonresidential investment from reduced demand. In doing so I looked at the relationship before 2008 between building in the two sectors and the business cycle. Not surprisingly, nonresidential building follows a business cycle, going up and down with national employment. As you might guess from Chart 1, more residential building is associated with less nonresidential building at a given point in the business cycle: each $3 billion of home building seems to crowd out nonresidential building by at least $1 billion. Now that’s crowding out: something that stimulated home building by $3 billion would raise total building activity, but only by $2 billion. I used the pre-2008 relationships to predict nonresidential building during this recession and through the third quarter of last year, under two assumptions: that crowding out continued as before, and that crowding out ceased once the recession began. Chart 2 shows the results, together with the same red actual investment data from Chart 1. The black line shows what would have happened to investment if it continued to move with employment, but crowding out disappeared. The blue line shows what would have happened to nonresidential investment if, in addition to moving with employment, crowding out continued at the same rate it did before the recession. The predictions based on continued crowding out (the blue line) correctly anticipated this pattern, as well as the actual sharp drop to begin 2009. Nonresidential building did fall after 2008 but, thanks to the movement of resources away from housing, it fell less than it would have in a recession this deep. The Keynesian model ignores the crowding-out effect, and thereby consistently underpredicts nonresidential building during the recession. Thus, all else the same, it appears that less spending in one sector is partly replaced by more spending in another. Sometimes there are good reasons for the government to spend more, but Chart 2 shows how one of the costs of government spending is that it displaces spending in other sectors, even during a recession.